Today, another woman has called out the Metropolitan police for their exploitative actions against women affected by undercover policemen. This time it’s Jennifer Francis, the ex-wife of undercover officer Peter Francis. In this article Jennifer describes how the police viewed her as being ‘usable, abusable and disposable’; as ‘collateral damage’. The words echo those expressed by many of us deceived by undercover officers – many operating in the same unit as Jennifer’s ex-husband – in their fake identities. In solidarity with Jennifer Francis, PSOOL publishes her poem: a personal response that illustrates the painful clashing of private and public lives. 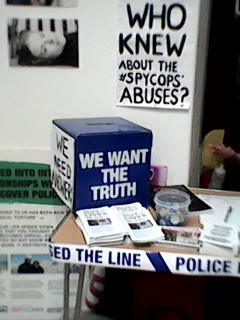 We share an experience of being manipulated, betrayed and abused by the state and will continue to fight for truth and justice together. Direct from the horse’s mouth. The confirmation of a phrase of suspicion. Came the final destruction of my marriage. That had suffered so much damage. His betrayal was quite clear. And no longer was there any doubt. And to me he had committed the ultimate crime. What had our union of marriage meant to him? Intimate relationships, not one but two. Likely, I may never know the truth. Quietly buried in my heart. But the betrayal lives on. In the search for truth, justice and peace. And rebuild my trust and faith. in writing from the copyright owner.